Must be bad if Goodyear represents about it -- On the irl site. My guess is the league is already going to make the switch after Indy (or at Indy) and Goodyear is allowed to say this to give the change some cover. But sometimes I see black helicopters too. 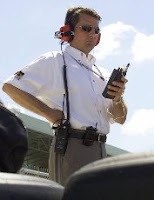 I think I just realized that I have a platonic crush on Scott Goodyear. If I could go back in time and change things for him I’d see that he got his 500 win. He might be happier with his face on the Borg-Warner trophy. So which one would you give him? The nose out by Little Al('92), the penalty that helped Villenueve('95), or the restart when Luyendyk won('97)? All i know is that the IRL desperatly needs to change some things when the most exciting aspect of a race is looking to see if DW's car will break down and watching Danica try and get around 5th place Tomas Sheckter when it won't even give her a better position. i went to race and as a diehard IRL fan, i even felt a lttle bored.